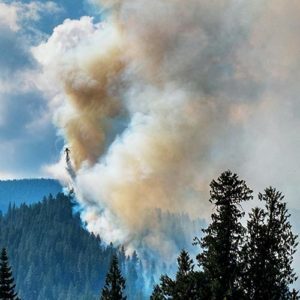 The world is changing in any number of troubling ways—a growing population, a warming climate—but summertime wildfire has become a constant in North Idaho, a familiar presence. Or so it seems. “The telling month here is June,” said Mike Behrens, fire management officer for the Panhandle National Forests, giving the typical rule of thumb for predicting the coming wildfire season: “If June is cool and wet, we’ll generally have a shorter season. 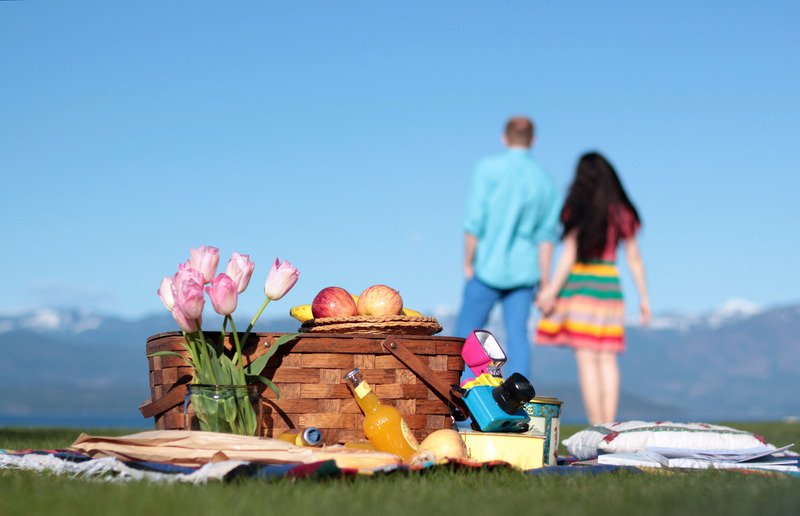 If June is hotter and drier…”. Here, Behrens trails off to acknowledge that even the familiar face of fire is changing. Fortunately, he added, in 2017 the Panhandle dodged the number of lightning strikes that made 2015 such an intense fire year. The Forest Service throughout Idaho saw 729 wildfires in 2015 that burned 377,572 acres. Last year, 2017, Idaho’s national forests saw 481 fires that burned over 257,934 acres. Heading into the current 2018 season, the long-range forecast (“You’re talking 120 to 150 days out, you know, which, as far as the weather goes, [you take] with a large grain of salt.”) predicts a warmer and drier summer from July into September. Those “conditions typically indicate a big fire season, especially when those above-normal temperatures start in June, which is what we’re looking at right now,” Tobin said. “We are seeing more extremes right now, and we are seeing longer fire seasons,” said David Groeschl, director of the Idaho Department of Lands. 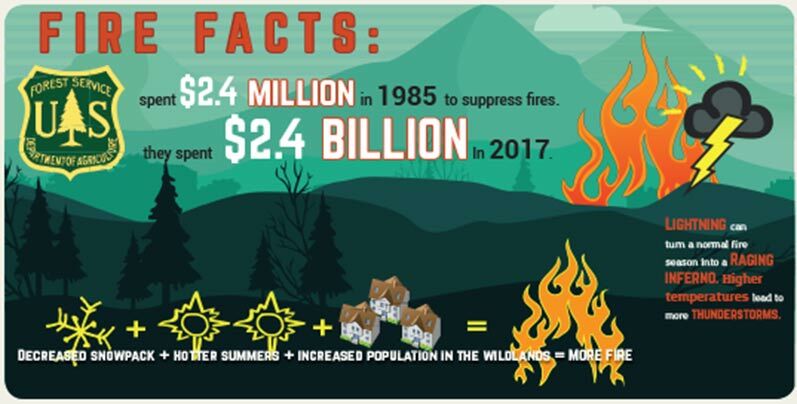 Recent research shows the climate is warming, snowpacks are shrinking and the population is increasing in what’s known as the WUI, the wildland urban interface. Philip Mote, director of the Oregon Climate Change Research Institute at Oregon State University, released a study in March that showed dramatic declines in snowpack throughout the West, an ominous finding as less snowpack provides more time for the forests to dry out. Although the April 1 snowpack for North Idaho this year was about 120 percent of normal, the OSU study showed that average snowpack in the West has shrunk by about 30 percent in the last 100 years. “I wasn’t prepared for how much worse it had gotten in the intervening years,” said Mote, who began his snowpack studies in 2003. The study also determined the snowpack loss is due to warmer temperatures, not less precipitation. As wildland fire risk grows, there are more houses and more people affected by it. Miranda Mockrin, a research scientist at the Forest Service’s Northern Research Station in Baltimore (yes, Baltimore), conducted GIS mapping of changes in the wildland urban interface using census block data. From the 1990 to the 2010 censuses, the WUI grew by 42 million acres, reaching 190 million acres. Housing increased by 41 percent, to 43 million homes in 2010. “Population growth and development into the wildland urban interface is making wildfire management harder in many ways,” Hessburg said, explaining protection of lives and property becomes the priority and makes full suppression the most likely strategy. The Forest Service spent a record $2.4 billion on fire suppression last year, according to National Interagency Fire Center information. The agency spent one-tenth of that amount—$2.4 million—in 1985. Fire suppression has cost the Forest Service alone more than $1 billion each of the last seven years and consumes more and more of the agency’s operating budget. Bosworth was one of six former USFS chiefs who sent a letter to congressional leadership in January 2018 urging a change in the way the agency budgets. The number of employees doing the sort of work Bosworth described above fell from 19,000 to 11,000 over the last 20 years while the number of firefighters doubled. Rep. Mike Simpson (R-ID), who had been pushing a funding change for six years, an aide said, finally got a bill into the Omnibus Spending Act the U.S. Congress passed just before Easter break. The bill sets aside $2 billion a year for 10 years for fire suppression. The separate fund frees up millions in the operating budget the Forest Service can now use for fire-prevention efforts such as thinning, logging and prescribed burns. In Idaho, USFS fire suppression costs have exploded from $12.2 million in 2009 to $93.5 million last year. The low-snowpack, hot-weather season of 2015 cost $152.8 million and 2012—a year when nearly one million acres of national forest burned in the state—cost $169.1 million to extinguish. The historic focus to stamp out every fire has created forests overcrowded with trees and debris, said Hessburg, the researcher in Wenatchee. 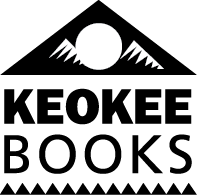 He advocates using fire as a tool as American Indians did for thousands of years, and as occurs naturally. Fire can leave a more open forest with larger, and thus more fire-resistant, trees and effective natural fire breaks, Hessburg said. He illustrates the concept in a PowerPoint he shows all over the region as well as in a TED talk online. However, increased development in the wildland urban interface can become an obstacle. “Prescribed burns are harder to pull off in the WUI because people now ‘new to the neighborhood’ don’t want smoke near their home,” he said. Bosworth agreed and said it’s almost absurd that smoke from a prescribed burn can be shut down as a nuisance by air quality regulators, while the condition the intentional burns are meant to mitigate—the more massive and harmful smoke from wildfires like those that choked the Inland Northwest last summer—is considered an act of God. The Idaho Department of Lands has other challenges, its director, Groeschl, said. “A lot of what we protect is private forest and state forest land, where the (timber) value is very important. Our goal is we manage those to maximize benefits to the (school) endowments and not to let them burn up in a fire,” Groeschl said. IDL also protects much of the state’s wildland urban interface, where the number of houses has nearly doubled, from 25,846 to 50,110 between 1993 and 2008, said Groeschl. He added the number of forested parcels with residences has increased about six percent a year over the past 10 years and, with more humans, there are more human-caused fires. “When you have houses and people’s lives at risk it makes it more challenging on how you attack the fire, and with what resources, and how do you evacuate people. It does add complexity,” Groeschl said. “What we’re seeing is an urgent need to put more energy into fire prevention and education with all the homeowners in the WUI,” Groeschl added. But in a state that is loathe to regulate, IDL is limited to promoting common-sense practices and running Firewise programs on living with the threat of fire. Being prudent when living with fire risk can be reinforced by insurance companies or by county government, each encouraging “best practices” through policy restrictions or planning and building codes. “As more people pack into the West, we’re going to have to decide how we’re going to live amongst each other and what we choose to spend our money on,” said Behrens, the fire management officer for the Panhandle Forests. “Do we spend on doing some things up front with maybe zoning, or what materials to use to build your home, the landscaping? Jeanne Higgins, the new Forest Supervisor for the Panhandle, was still speaking from her office at USFS headquarters in Washington, D.C. earlier this spring when she talked about the challenges in the region. The county taps into fire awareness and fire prevention grant programs so homeowners can make their properties more resistant to wildfire. “It’s the rural nature, the rural character of the land in Bonner County that attracts people to come up here, and we want to maintain that,” Bailey said. Currently, building permits—which were briefly abolished by a previous board of commissioners—require a local fire district to ensure tenets of the International Wildland Urban Interface Building Code are being followed for construction in the WUI. The code deals with use of fire-resistant materials, creating defensible space, and water storage on site for use in fighting fires. The year 2017 was the costliest on record for weather and climate disasters—$306 billion in losses from hurricanes, floods and wildfires, according to the National Oceanic and Atmospheric Administration. Research by Headwaters Economics, meanwhile, shows the wildland urban interface is still largely empty. Nearly 84 percent of the WUI in the West is undeveloped, including 86.5 percent in Boundary County and 64.9 percent in Bonner County. Put those factoids together, and wildfire losses are likely to get worse. Many people interviewed for this story said more rigorous implementation of stronger building codes is critical. Better collaboration among federal and state agencies, local governments and insurers “will ensure future development is done with an eye toward safe developments and keeping firefighters safe,” said Jonathan Oppenheimer, government relations director of the Idaho Conservation League. 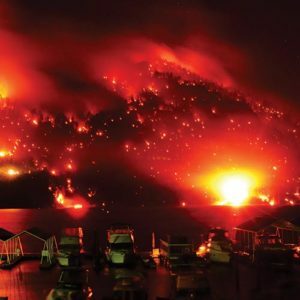 The Cape Horn fire started near the water’s edge in July of 2015 near the town of Bayview, at the southern tip of Lake Pend Oreille. Over 1,300 acres were burned; nine homes and five outbuildings were completely destroyed, with an additional home damaged. The estimated cost to fight the fire was $5.6 million, and 650 people were evacuated. An April 2018 investigation report on the Cape Horn fire done by Idaho Department of Lands stated the cause of the fire is still unknown. The fire started about 20 feet above a small, rock beach and a “high wind event” on July 25 fueled the burn. The Forest Service estimates a repair cost for the forest—reforestation, surveys, labor and more— of $162,822. That amount does not include the value of the timber burned. Clark Fork Complex A lightning storm in August 2015 started several fires along the Idaho/Montana border, including one in the proposed Scotchman Peaks Wilderness area. 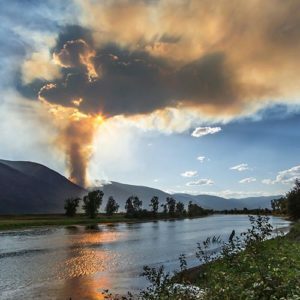 The six fires, which burned from Clark Fork to Noxon, Montana, became known collectively as the Clark Fork Complex, and burned almost 16,000 acres over the next month. The fire cost around $4 million to fight.